Michael J. Caligure, a full-time Bend firefighter since 1982, exhibits images of professional Bend Fire & Rescue firefighters during training and local emergencies in his August photography exhibition this month. Having the experience of both a photographer and a firefighter, Caligure depicts first-hand the energy, emotion and magnificent blaze of the fire scene, while documenting the heroes who risk their lives everyday for our community. The exhibition at thump is a personal statement of Caligure’s career and his enthusiasm for depicting firefighters in action on the scene. Caligure’s photography tells stories of the personal tests, experiences and conquests in the life of a firefighter. In this exhibition, Caligure’s subject is firefighters in action, however Caligure also enjoys capturing images relating to everyday life and important landmarks in one’s own journey. “My passion for photography began around 1979 when I purchased my first camera,” Caligure says. “ I enjoy outdoor activities, so many of my photographs consist of landscapes and aerials.” His body of work also includes portraits and sporting events. July’s Thumpology explored the seasonality of coffee harvesting and how, like eating fresh produce when it’s in season, drinking coffees brewed from newly harvested beans is a more flavorful and enjoyable experience. Some coffeehouses — like thump — feature ever-changing drip coffee offerings that reflect what coffees have been recently harvested around the world. As mentioned last month, coffee blends have a different story to tell. If you visit a coffeehouse and notice the same blend of beans being served throughout the year, the coffee roaster might use the same beans each time to create that blend (for example, a combination of Guatemalan, Indonesian and Brazilian). Those green beans might be up to a year old — the time passed since the last harvest. Here’s a different scenario: Throughout the year, the roaster uses different, newly harvested beans in the blend and recreates a consistent flavor for the blend. 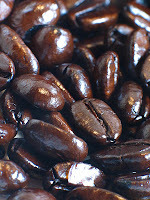 For example, thump uses Stumptown Coffee Roaster’s Hair Bender Espresso Blend 365 days of the year. It’s Stumptown’s challenge to maintain a consistent flavor profile in this blend using an ever-changing selection of coffees. Stumptown continually explores the body, complexity, acidity and flavor compatibility of their coffees. Each coffee that makes up the blend is roasted separately to develop its individual flavor profile so it will be optimally compatible with the other beans in the blend as well as to address its unique physical aspects, such as bean size, density, and moisture content (see past thumpologies on roasting). The beans are then blended together at the proper ratio to maintain that beautifully complex flavor that keeps us all coming back for more. If you strip away the milk and flavorings and just taste the espresso, you’ll appreciate that this blend is dynamic and changing subtly and tantalizingly throughout the year because of its ever-changing “ingredients” — but it’s consistently delicious! To blend well without taking the beans to a dark roast, which effectively roasts out the flavors of the individual beans, is a true art. Three cheers for a great blend and a talented roaster! Cuppings are usually the third Sunday of the month at 1:30pm - get details at our website and by subscribing to our email newsletter. Join us every Friday for a celebration of the classic Italian espresso concoction, the Traditional Cappuccino. During TradCap Happy Hour — or Cappy Hour, if you will — enjoy half-priced traditional espresso drinks, dopios, macchiatos, and traditional cappuccinos. Many people have never ventured to try these delightful little drinks. No syrup, no chocolate, just espresso and perhaps a small embrace of milk steamed to sweet, velvety perfection! Thump has wonderful organic and sustainably grown coffee grounds available for composting and worm bins. Coffee grounds' very jagged microscopic surface area helps speed up the breakdown of the biomass being composted. Call 388-0226 to arrange a pick-up time for your coffee grounds. (Bend, OR) Beginning Friday, August 1, the sculptures and paintings of Andrew Wachs and David Wachs will be on display at tbd loft. The show opens with a First Friday reception from 5 – 9 p.m. and runs through September. Andrew Wachs is a metal artist who lives and works in Bend, Oregon. The landscape and color fields of central Oregon continually inspire Andrew. and Much of his work is representative of my many travels from Bend to Portland. Andrew’s most recent works are in Bend’s new roundabout located at Bond and Wilson in the Old Mill District as well as a public sculpture in Northwest Crossing. The work exhibited at tbd loft will represent a broad perspective of Andrew’s recent work. Andrew works primarily in steel and the exhibit at tbd loft is a study of composition and form. tbd loft is located at 856 NW Bond Street, Suite 2 above Norwalk Furniture, in downtown Bend, Oregon. Bistro Corlise is now offering happy hour from 5 to 6:30, Wednesday through Sunday. Specials include selected appetizers and house wines by the glass for $5 each. A great introduction to French cuisine and wine! Did you know that the third Saturday in August is National Sparkling Wine Day? Come join us for bubbles and smiles on August 16th. We will be pouring champagnes and sparkling wines by the glass and pairing them with specially prepared small plates. This will be an informal event, starting at 5pm. Don't miss out! Trail work take two! With no national holiday looming, you have a slightly shorter list of excuses not to come out and build some trails with COTA and FootZone. FootZone has teamed up with the trail building gurus at COTA (Central Oregon Trail Alliance) for some evening trail building sessions. The work will be done at Wanoga Snow Park for the new trail system going in. Meet at the FootZone at 5:30pm on August 7 so we can head up to Wanoga togther for some trail building fun. RSVP with Dave if you can: Superdave@footzonebend.com. Bring some work gloves, water, long pants, some sturdy footwear, and a Can-Do attitude. Tell your friends, parents, kids, crazy uncles, and the weird neighbors down the street. The more people we have the more trail gets built. No prior trail-building experience necessary. When KPOV commenced programming on June 25, 2005, we wanted to offer the community an audio outlet, a gathering place for voices, music, thoughts, and political discourse seldom or rarely heard on the airwaves in Central Oregon. We strive each and every day, every show, every minute to entertain, educate and engage our community through low-powered, high quality radio in Bend. Now, a little more than three years later, KPOV has the rare opportunity to achieve an even more ambitious goal! The FCC recently granted KPOV a construction permit to build a full-power community radio station broadcasting at 13,500 watts! We now have three years to secure the funding, build the infrastructure and develop even better programming line up than we have today. How will you and our community benefit? - A more powerful signal will alleviate the reception issues many in Bend currently face with our low-power signal. In addition, residents in surrounding central Oregon communities will also be able to receive our signal. - KPOV intends to offer an even greater presence in the community, from broadcasting and appearing at festivals and events to live election and political coverage to continuing to develop our web presence. We will begin planning the transition to full-power later this year, with the help of community radio consultants and staff at the National Federation of Community Broadcasters. We'll keep you posted along the way and will ask for your input as we move forward. The Oregon Department of State Lands (DSL) has applied to acquire and develop over 1,500 acres of public land near Deschutes Market Road from the Bureau of Land Management (BLM). The DSL plans to sell these lands which may then be re-zoned to allow for commercial, industrial or residential use. A public meeting will be held July 23rd 7pm-8:30pm at the Pilot Butte Elementary School, 1501 NE Neff Road, Bend Oregon. Please show up to share comments with the BLM about these important lands. Comments can also be e-mailed to dslselection@blm.gov or submitted to: BLM, DSL Selection; 3050 NE Third Street; Prineville, OR 97754. 1) The DSL should acquire lands from the BLM to fund the Common School Fund and resolve the federal government’s land debt to the state of Oregon; however, these lands should fit into future development plans of Deschutes County and the City of Bend. The lands currently identified by the DSL are currently zoned for farm use and are located outside of Bend’s current and projected Urban Growth Boundary (UGB). 2) The lands selected by the DSL have been identified as "Area of Critical Environmental Concern" because the Historic Huntington Wagon Trail bisects this area. The area was also deemed appropriate for listing on the National Register of Historic Places. 3) The lands selected by the DSL also contain old-growth juniper stands and associated sensitive wildlife. 4) The Upper Deschutes Resource Management Plan, completed by the BLM in 2005, classified this land as Z1. These are lands that the BLM planned to conserve due to their significant resource values. The DSL could and should select lands with limited resource values (i.e. those categorized by the BLM as Z2 or Z3 lands). 5) The BLM has limited funds to manage millions of acres of public land in Oregon. Because the DSL has selected lands that have significant conservation and resource values, the BLM will need to undertake a costly amendment to their recently-adopted Resource Management Plan. The DSL should cover the costs incurred in this process and for necessary compliance under the National Environmental Policy Act (NEPA). Get more info about the Oregon Natural Desert Association. (Bend, OR) Commute Options for Central Oregon, the local nonprofit committed to promoting choices that reduce the impact of driving alone, is moving offices — and doing it with bicycles. On Friday, August 1 Commute Options needs volunteers to help make the move via biking, walking, running or any other human-powered mode of transportation. Commute Options is excited to move their offices into the new 919 Bond Street building. Volunteers should meet at 10:00 a.m. at Commute Options' current location (155 NW Irving Ave. in Bend). Bicycle trailers needed. To sign up and get details, contact Commute Options at 541-330-2647, or go to www.commuteoptions.org. (Bend, OR) In order to include more of the Bend-area community, 4 Peaks Music Festival has extended its Early Bird discount tickets which includes both festival days and camping. In addition, single-day tickets now can be purchased separately at a reduced rate. This is a great opportunity to save money on tickets and experience the warp and woof of the 4 Peaks Music Festival. Journalist Amy Clark recently described 4 Peaks Music Festival: "A two-day music festival that’s kid-friendly, offers room for snoozing and has a breathtaking backdrop is rare these days . . ."
For tickets click here, or visit Ranch Records on NW Wall St. in downtown Bend. 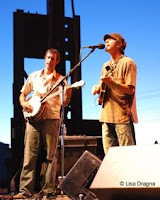 Also, check out the latest edition of the Festivarian newsletter, which profiles 4 Peaks Music Festival artists Poor Man's Whiskey, Flowmotion and local act Brent Alan. Working in collaboration with Carlos Perez at Perez design, we branded and named this new Bend-based, business-to-business print and workflow solutions provider. Headed by Gale Slaughter, an industry pro with nearly 30 years of experience, Coriant is an outsource partner for all manner of printed and promotional materials, as well as a comprehensive suite of online workflow management tools. The company serves customers in all industries, but it focuses on the education, finance and health care markets. Our biggest challenge was concisely communicating the essence of a company whose products and services encompass such a broad spectrum. The Coriant name is a neologism derived from "core" business functions and the "reliant" relationship the company builds with customers. Phase I of the company website just launched: www.CoriantInc.com. Scott Donnell of Donnell Design produced the Flash animation for the homepage. The site is set-up to take advantage of the open-source content management system, Joomla, which gives the client a web browser-based interface to easily update and manage the site's copy and graphic content, as well as to dynamically add or delete pages to and from the navigation. Side note: Perez design, Donnell Design and Ad HOC are all now sharing an office space in downtown Bend. Although we all continue to work independently with our own individual clients, sharing the space facilitates collaboration on projects and offers clients a single location to access a variety of services: branding, marketing, copywriting, advertising, public relations, graphic design and web development. Read on for the updated band schedule for the two day festival July 25-26. For details, visit www.4peaksmusic.com. Two-day and single-day festival passes are available at Ranch Records on NW Wall St. in downtown Bend or on the web. PORTLAND, ORE. ⎯ The Bureau of Land Management must rewrite its land use plan for southeast Oregon due to a landmark decision from the Ninth Circuit Court of Appeals on Monday. The BLM wrongly refused to evaluate impacts to wilderness values on the public lands in the challenged plan, according to the decision, which overturned a district court decision upholding the plan. The ruling will have a profound impact on BLM’s management of the public lands it is charged with protecting. The court specifically rejected BLM’s disavowal of “the very idea of wilderness” as one of many resources and values for which the agency must manage. Finding that the law, including BLM’s own guidance documents, unmistakably requires BLM to analyze impacts to a landscape’s wildernessvacated the plan and ordered BLM prepare a new plan. The plan, the Southeastern Oregon Resource Management Plan (SEORMP), governs the federal agency’s management of about 4.6 million acres of public land, mostly in vast Malheur County. It is to guide BLM’s management of some of the most treasured landscapes in Oregon, including the Owyhee Canyonlands, for the next 20 years. The bulk of the lands to be managed under the plan are comprised of fragile high desert and sagebrush steppe. In addition to its wilderness ruling, the court agreed with ONDA that BLM had not considered reasonable alternatives for off-road vehicle use. Less than 0.5% of the area is closed to damaging ORV use. In its analysis leading up to the plan, BLM never even considered closing more than a fraction (0.8%) of the planning area to ORVs. In fact, every alternative BLM considered would have further reduced the area currently closed to ORVs. Similarly, less than 2% of the area is currently off-limits to livestock grazing. In its own 2004 wilderness inventory, ONDA found that 1.3 million acres of the planning area, not including existing Wilderness Study Areas designated by BLM in 1980, possess wilderness character. Congress in 1964 defined “wilderness” on the public lands as consisting of large areas that are roadless, essentially natural, and provide outstanding primitive recreational opportunities. ONDA used BLM’s own wilderness inventory manual to conduct its inventory although the Bush Administration has since revoked the manual. The court’s decision rejects the Administration’s disavowal of wilderness values when managing the public lands. ONDA prepared its inventory after the BLM refused to consider wilderness during the agency’s environmental review for the SEORMP. The plaintiffs, the Oregon Natural Desert Association, joined by the Committee for the High Desert and Western Watersheds Project, filed the lawsuit in July, 2003. The Ninth Circuit’s ruling sets aside the SEORMP and now sends the matter back to BLM to prepare a revised environmental review and a new plan that reconsiders its management decisions in light of its obligation to protect wilderness values. PORTLAND, Ore. (AP) — Federal appeals judges have told the U.S. Bureau of Land Management to take another look at its plans for about 4.5 million acres in Eastern Oregon — and to consider wilderness values when it does. The 9th U.S. Circuit Court of Appeals ruled Monday the bureau's plans for the area are too narrow. The judges say the bureau should include in its management plans areas where grass, sagebrush and juniper are reclaiming unused roads. And it said the bureau should manage lands with an eye toward preserving their wilderness characteristics — even if they haven't been designated as wilderness areas. As a result, the appeals court says, the agency must redo a management plan in the works since 1995. That plan, in turn, was a response to a law passed in 1976 that required federal agencies to make plans for the lands under their control. The suit was brought in 2003 by the Oregon Natural Desert Association. It involves land in three counties, Malheur, Grant and Harney, where the bureau leases extensive tracts of grazing land to ranchers. The environmental group said the bureau in 1980 compiled an inventory of lands in the area with potential to be declared formally as wilderness areas. But by the late 1990s, the group said, another 1.3 million acres had become eligible for consideration for wilderness because what once were roads turned into little-used ways, small reservoirs had dried up and land infested by invasive species had been returned to native vegetation. The bureau, the court said, insisted that its wilderness study ended in 1980 and didn't need to be reopened. A trial judge agreed. But, the appeals court said, "Wilderness characteristics are not simply a checklist" to be used for a one-time inventory. Instead, the court said, the bureau is obligated continuously to manage land with wilderness characteristics. It said that even if the Congress hadn't designated such land as wilderness, the bureau could protect it against damaging uses such as mining, grazing and off-road vehicle use. A spokesman for the bureau, Michael Campbell, said it had not decided whether to appeal. He said land in Eastern Oregon doesn't change quickly, but, "That said, we're always willing to look at new information." Representatives of the Oregon Natural Desert Association did not immediately return phone calls. Who do you think builds those mountain bike trails - ELVES? Actually, volunteers just like you build and maintain many of the local trails you bike, hike and run on. Why not spend a few hours supporting the local trail system you know and love? 5:30 p.m.: Meet at Pine Mtn. Sports and carpool to the trailhead. Bring work gloves, a hydration pack or water bottle and protective eye wear. Wear long pants and sturdy shoes or boots, and be prepared to get dirty. COTA will supply tools and on-site guidance. RSVP Pine Mtn. Sports: 541-385-8080. 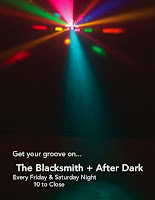 Every Friday and Saturday night The Blacksmith transforms into The Blacksmith After Dark. Get your groove on with local DJs, dancing, and a special late night menu. From 10 to close. Join The Blacksmith’s own beer connoisseur’s study group in the Anvil Room each Wednesday from 5-7 PM. Sample 5 beers for $10 per person. Local Brews from Central Oregon's finest - Deschutes Brewery, Cascade Lakes Brewing, Bend Brewing Company, Silver Moon Brewing and Wildfire Brewing. The Local Brews Beer Tasting last month was a "Who's Who" of the Bend-area microbrew industry. Brewmasters from each of the breweries were there, as well as Gary Fish, owner of Deschutes Brewery — a great assembly of connoisseurs and everyday beer lovers. Bring the whole family to the Blacksmith for a Sunday dinner to rival Grandma’s. For $26 per person, we’ll keep passing the meat and potatoes until you say when. Every Sunday, 5:00 to 8:00 p.m. The Blacksmith Restaurant + Bar + Lounge is located on 211 NW Greenwood Avenue in Bend, Oregon. Fri. 7/11, Cascade Cycling Classic: Open late til 8:30pm for the Cascade Cycling Classic's stage #4, the Downtown Criterium race. Starts at 3pm - come early and get the best seat for the race. Anne Hubler, a well-known Ohio fiber artist whose work is included in the permanent art collections of the White House and the Ohio Governor's Mansion, will exhibit quilts during July. Hubler is the mother of thump owner, Hazel Chapple. "Her work isn't just patterns or combinations of fabrics. They tell a story. Her work as a fiber artist has helped raise the profile of quilters and other fiber artists," said Judy Mott, executive director of Montgomery County Arts and Cultural District in Dayton, Ohio. Throughout her career, Hubler has exhibited extensively in Ohio. Three of Hubler's pieces were chosen for inclusion in the Ohio Governor's residence permanent collection. She has received many awards, including a lifetime achievement Special Commendation Award from the Board of County Commissioners and the Montgomery County Arts and Cultural District this year. For the thump exhibit, only one piece, "Orange Barrels," is a traditional quilt constructed of three layers (surface, batting, backing). The others use a process of hand stitching tiny pieces of fabric on artist's canvas. Hubler says she made this transition in technique because the final pieces are less bulky, easier for transport and exhibition. View an interview with Anne Hubler from Ohio Public Broadcasting. thumpology: Coffee Crop Seasonality - Get it While It's Fresh! Many people don't think of coffee as an agricultural product that, like strawberries, peaches, and cherries, has a specific growing season. When fresh fruit is in season, you're in heaven and you can't get enough of it! When out of season, it's usually a disappointment to eat. Similarly, coffees around the world ripen and are ready for harvest at different times of the year, and a newly harvested coffee is oh so good! Even when stored in its unroasted, green bean state, its flavor changes and ages over time in a not so graceful way. If you go to a coffeehouse and notice that they offer the same bean year round, (blends are a different subject) with the knowledge that most growing regions have only one or two annual harvests, you might wonder how old that coffee really is, regardless of how recently it's been roasted. The age of the green bean does affect its roasted flavor. If you look at Thump's whole bean selection, you will notice that it is always changing. A great thing for the flavor adventurer, and a little nerve-racking for the person who wants the same bean every time. Our selection changes because our coffee roaster, Stumptown Coffee Roasters, buys coffees in small quantities when they are at their optimal age for roasting. And to insure freshness, Stumptown rarely buys more than can be consumed within a handful of months. When the beans are gone, they're gone until the next harvest. When they do come back, we feel like an old friend has returned to us! Two of those friends just returned to Thump, the Guatemala Finca el Injerto, Stumptown's first Direct Trade coffee, and the Panama Carmen Estate, Direct Trade. If you're ready to put your toddy glass down for a minute to try a hot coffee, both of these friends will treat you right! 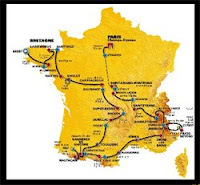 We'll have a large flat-panel TV set up in the shop, tuned into televised coverage of the 95th Tour de France. Join us every day until the last stage on Sunday, July 27. Click here for the schedule. Caffeine doping is encouraged - viva la tour! Starting Fri., July 11 join us every Friday for a celebration of the classic Italian espresso concoction, the Traditional Cappuccino. During TradCap Happy Hour, enjoy half-priced traditional espresso drinks, dopios, macchiatos, and traditional cappuccinos. Many people have never ventured to try these delightful little drinks. No syrup, no chocolate, just espresso and perhaps a small embrace of milk steamed to sweet, velvety perfection! Thump has wonderful organic and sustainably grown coffee grounds available for composting and worm bins. Coffee grounds' very jagged microscopic surface area helps speed up the breakdown of the biomass being composted. Email us at thump@thumpcoffee.com or call 388-0226 to arrange a pick-up time for your coffee grounds! Click here to find out more about composting. In Gusto magazine’s “Best Of” reader’s poll, Jackalope Grill has been awarded "Best Fine Dining," and for the second year in a row “Best Northwest Cuisine.” To read the Gusto article click here. The Jackalope Grill's Chef Timothy Garling, along with Sous Chef Drew Lloyd, will show how to prepare some of the most popular dishes at the Jackalope Grill. Cost is $50, and payment is due upon registration. Space is limited. For registration and details, call 318-8435. 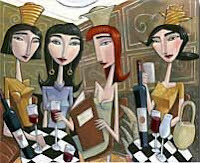 Women Tasting Wine returns to The Jackalope this month for "Summer Sipping Wines" on Monday, July 28 at 4pm. Cost is $45. For more information please contact Diane Sienko at Bend Wine Cellars (388-7564), or go to the Women Tasting Wine website www.womentastingwine.com. Coming up in August . . .
Former Deschutes County Commissioner Swearingen Joins Oregon Natural Desert Association for Meetings with Congressional Leadership in Washington D.C.
(BEND, OR) Today in Washington D.C., members of the Senate Subcommittee on Public Lands and Forests heard testimony on the Oregon Badlands Wilderness Act (S. 3088), introduced last month by Sen. Ron Wyden (D-OR). Oregon Natural Desert Association’s executive director Brent Fenty and wilderness coordinator Gena Goodman-Campbell, as well as former Sisters mayor and Deschutes County commissioner Linda Swearingen, submitted testimony at the hearing, and are in Washington this week to meet with key congressional leadership concerning the wilderness bill. The Public Lands and Forest Subcommittee also heard testimony on Sen. Wyden’s Spring Basin Wilderness Act (S. 3089), which will protect more than 8,600 acres overlooking the John Day Wild and Scenic River. At the hearing, Senator Smith announced that he would like to cosponsor the bill with Senator Wyden. For more about the Oregon Badlands and Spring Basin Wilderness and the Oregon Natural Desert Association, go to www.onda.org. :: THE BANDS – Two Days, Two Stages, 20 Bands. Internationally recognized music interpretative painters VORCAN will be making a stop at this year’s festival. Formed in 2006, VORCAN is a collaboration between two prolific artists, Vort and Cank, who started an art production company and abstract art consulting firm called in Philadelphia. They began collaboratively painting live music of all genres in a variety of venues and events throughout Philadelphia and New York City. Using the music and environment as inspiration, Vort and Cank, create fine art using collaborative imagery. VORCAN has painted over 250 events in The United States and across Europe. Check out VORCAN's art here. Local artist Chris “Buffalo” Folsom, known for his larger-than-life metal sculpture creations, will also be working on-site at the festival. Folsom, whose work includes strikingly graceful animal sculptures such as his piece titled “Momma Bear and Cubs in Traffic Circle” located in a Madras roundabout, will provide festival-goers with the opportunity to watch first hand as the artist creates innovative and original work. More about Buffalo Folsom Sculpture. 11am- 4pm: Prayer Flags! Make your mark on the Festival by creating your own prayer flag. There will also be mask making, chalk art and fun crafts for the kids. 4pm: Kids Parade through the Venue! The newest Festivarian newsletter is up with spotlight on bands Zilla and Hot Buttered Rum. For more information, details and tickets click here or visit Ranch Records on NW Wall St. in downtown Bend. The Recreation Group will raffle off (4) $50 gift cards/certificates that can go toward any activity they offer. The Recreation Group is a one stop shop for all your recreation and makes booking your trips very easy. The website is found at www.recreateoregon.com. Outfitters that will be using the system this summer include Central Oregon Adventures, Chockstone Climbing Guides, Cog Wild Bicycle Tours, Lava Lands Adventure Tours, Mountain Mopeds, Osprey Adventures, Sun Country Tours, and Sunriver Soaring, and The Truck Stop. Customers can book the following activities; ATV tours, Canoe and Kayak trips, Geocaching, Glider rides, Hummer tours, Mountain Bike tours, Rock Climbing trips, Scenic Flight tours, Skateboarding, Scooter rentals, Waverunner rentals, and White Water Rafting. All proceeds will go directly to benefit Commute Options for Central Oregon. The restaurant will be open to the public but the private outdoor concert venue with fenced beer garden will be reserved for 21 and older with separate family seating on the deck, admission fee will be collected upon entry of fenced area. Deschutes Brewery beer will be exclusively sold in the beer garden. Eight different local businesses will host each concert and provide sweet prizes that will be raffled off on their night. Each admission includes one raffle ticket for prizes given away from the hosting business. Additional tickets can be purchased for $1.